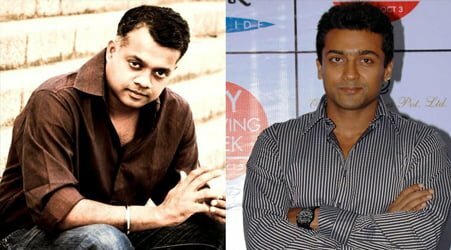 Home Hot News Suriya and Gautham Menon to Join Again ? Suriya and Gautham Menon to Join Again ? Suriya and Gautham the HIT combo is all set to be back after a small misunderstanding ! Suriya and Gautham Menon has jointly given hit movies like “Kaka Kaka ” and ” Varnama Ayiram ” . After that Gautham Menon was busy doing STR’s “Acham Enbathu Madamayada ” and Thala Ajith’s ” Yennai Arinthaal ” mean while ” Dhuruva Natchathiram ” was planned by Gautham for Suriya and both had some misunderstanding during that time and they left the project as such. Now the current Buzz is that Gautham has decided to bring back “Dhuruva Natchathiram ” and Suriya will only be the lead hero. This news has made whole kollywood industry into Surprise. Both Suriya Fans and Gautham Menon fans are extremely happy and are eagerly waiting for the movie. Lets hope the best !